A low bridge in Banbridge, County Down, has been hit by a vehicle for the fourth time in less than a year. It happened as the lorry drove under a 19th Century stone bridge in the town centre, known as The Cut, at about 21:25 BST on Tuesday. The lorry appears to have some damage to its roof. The road under The Cut – Bridge Street – was closed for a short time, but no injuries were reported. The last incident happened in May. 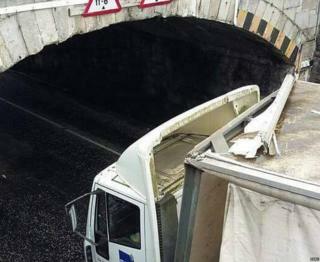 In November a prison service van hit the bridge and lost its roof. 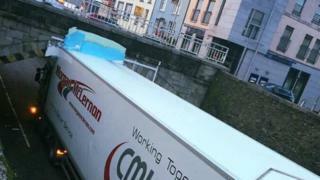 The following day a second lorry became stuck under the bridge. At the time, officers used the image as a warning to drivers of other high-sided vehicles, advising them to know the height and dimensions of their lorries before passing under bridges. There is to be a retrial in the case of a Caledon farmer accused of causing the death of his father who was killed in a collision between a tractor towing a trailer and an HGV lorry. Phelim Brady died on June 25, 2014 following a collision on the A4 Dual Carriageway, Dungannon. He had been travelling on the draw bar attaching a tractor to a trailer loaded with cattle. His son Paul Alexander Brady (46) of Minterburn Road, Caledon was driving the tractor and it was later established he was disqualified and had no insurance. A lorry crashed into the tractor and trailer and Mr Brady Snr died instantly. Paul Brady was charged with dangerous driving causing death. He admitted driving while disqualified and not being insured. Co-accused, William Mark Murphy (53) of Prospect Road, Castlewellan was driving the lorry. He denied a charge of causing death by dangerous driving. The jury found him ‘guilty’ of death by careless driving, an offence he had accepted from the outset. The jury was hung in relation to the charge of death by dangerous driving by the deceased’s son. This morning (Monday) the case returned to Dungannon Crown Court with a decision to order a retrial. The two men sat side-by-side in the dock throughout the trial which lasted just over a week, before His Honour Judge Neil Rafferty QC. The tragic circumstances unfolded as Paul Brady pulled out at a junction onto the dual carriageway, and the lorry ploughed into the rear. Murphy only, finding him guilty of causing death by careless driving, which he had already admitted. However they were hung in respect of all charges against Paul Brady. Murphy will return to court for sentencing on August 3. He is also subject to an interim driving disqualification. Prosecuting counsel advised he had been instructed to seek a retrial. The judge ordered the matters of driving whilst disqualified and without insurance be put to Paul Brady, to which he pleaded guilty on both counts. Judge Fowler adjourned the case for a retrial date to be identified, which is likely to be October or November. Brady was remanded on continuing bail. A low bridge in Banbridge, County Down, has been hit by a vehicle for the third time in less than a year. It happened as the lorry drove under a 19th Century stone bridge known as The Cut. PSNI Banbridge posted a photo of the damage on Tuesday, with the caption: “Looks like we are going to need a bigger sign. The Cut 3, Lorries 0′. The lorry in question appears to have some damage to its roof. In November a prison service van hit the bridge and lost its roof. The following day a second lorry became stuck under the bridge. At the time officers used the image as a warning to drivers of other high-sided vehicles, advising them to know the height and dimensions of their lorries before passing under bridges. A 45-year old man was taken to hospital following a crash involving his car and two lorries, on the A75 Dumfries by-pass this morning. The incident happened between the A709 and A701 roundabout at around 7.20am.